Dimensions 0 by 10.75 by 9.25 in. 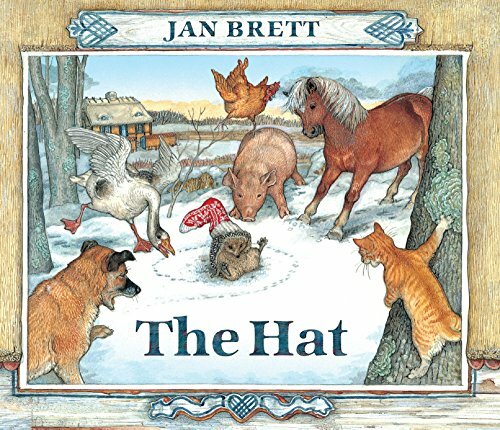 Amazon.com description: Product Description: A delightfully original companion book to Jan Brett's bestseller The Mitten. When Lisa's woolen stocking flies off the clothesline, Hedgie finds it and pokes his nose in. He tries to pull it out, but the stocking gets stuck on his prickles -- and the fun begins. A mother hen comes by, then a noisy goose, a talkative barn cat, a playful farm dog, a mama pig and her piglets, and a pony. They all laugh at Hedgie, especially when he pretends he's wearing a new hat. But in the end, it is clever Hedgie who has the last laugh. And where is Lisa when all of this is going on? She's in Jan Brett's signature borders, getting ready for winter, until she realizes her stocking is missing and she enters the story to look for it.